Congratulations to Ian McGregor Brown for winning a brand new coffee machine in our celebration competition. 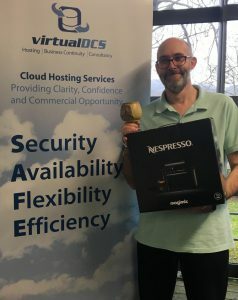 We’re happy to announce that Ian from Leeds was the lucky entrant to win the main prize draw and is now enjoying a good cuppa coffee (or several) from the virtualDCS team. Ian was the 13th entrant to the competition, proving that the number 13 is lucky for some. In case you didn’t know, the Twitter giveaway was created to celebrate 10 years of collaboration with Veeam. 10 years on, virtualDCS is now one of the most established Veeam Cloud Recovery providers in Europe and one of the very first businesses to offer Veeam Cloud Connect solutions to the masses. Although Ian was the lucky winner, we also had a number of fantastic entries that are worth noting! From dog mugs to fabulous affirmations, here are some of our favourites. If you’re not a winner, don’t worry, we’ve got more competitions in the pipeline and we’re still offering free Veeam cloud connect trials. If you’d like to find out more or to claim your free trial, simply use the form below or contact the team on 03453 888 327.